If you've been reading the headlines recently, you'll know several things about Scotland's Independence Referendum: it's abbreviated to IndyRef, a yes vote will break the Queen's heart, and it's only five days away. What you may not know, though, is that the world's most beloved animated Scot, The Simpsons' Groundskeeper Willie, wants Scottish independence — and he'll lead the country, too. If that doesn't convince voters, I'm not sure what will. On September 18th, Scottish residents will vote on a game-changing issue: stay part of the United Kingdom, or break away into an independent nation. As you can imagine, it's a complex, high-strung, emotional debate. The Brits want Scotland to stay — who wouldn't? — but the Scots aren't convinced that Westminster is acting in their best interest (or in anyone's best interest, for that matter). The campaigns on either side have been working hard to secure their votes, but it's a close call: no one's sure what's going to happen. Except that the scales have suddenly tipped. A Fox clip of the famous Scot released this week shows Groundskeeper Willie calling out for a "yes" vote, and dude? Once you've watched Willie the Groundskeeper rant in his (very questionable) Scottish accent, and seen him rip of his shirt to reveal a surprisingly chiseled yellow body, you may not remember what the point of the clip was, but you'll be convinced. Not necessarily because you want an independent Scotland, but because Groundskeeper Willie wants to lead the country and who in their right mind wouldn't want that. 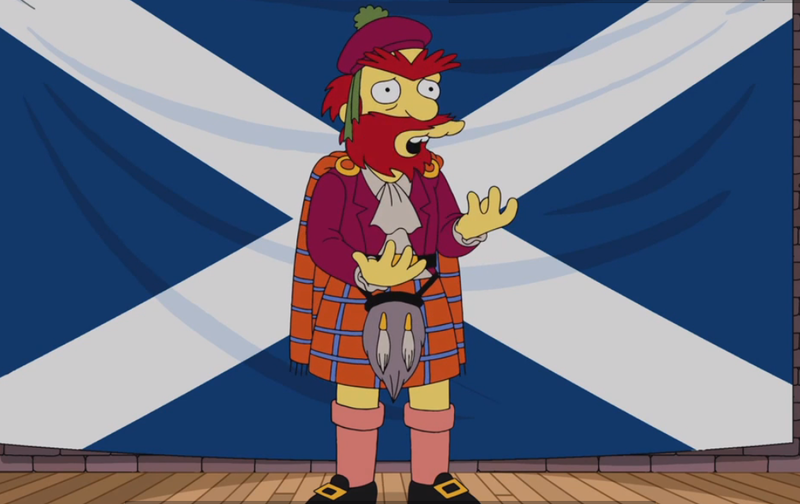 To encourage you to vote for him, he says: "'For a leader who can stand in the proud tradition of William Wallace and Andy Murray, won't you consider the return of Scotland's prodigal son — Groundskeeper Willie?" He adds that "Willie won't back down to world leaders, because I haven't a clue who they are and I'm not willing to learn" and that "I've lived in America most of my life, so I've seen first hand how not to run a country." And if that hasn't already convinced you (but who are we kidding, you've already mailed in your yes vote, and you're not even Scottish), he then rips off his shirt to reveal "Aye or Die" written on his chest. Think that's a tattoo? It's a friggin' birthmark, dude. Actually, he's not the only fictional character to have voiced an opinion on the debate. As The Daily Mail points out, Mike Myers/Shrek has come out on the opposite side, saying: "Shrek wants what the will of the Scottish people want. I love Scotland. I hope they remain part of Britain." Which is, you know, also persuasive. Kinda.